Menikdena, almost unknown to foreign travellers, is one of the best examples of a specific Sinhalese Buddhist type of monastic architecture called Pabbata Vihara. This kind of temple compound with buildings systematically arranged to a symmetric groundplan was widespread in the late Anuradhapura period. Though not far from the tourist hub Dambulla, Menikdena is a rarely visited heritage site, as it it not a must-see to be listed in pocket guides and standard itineraries. The archaeological site of Menikdena, also spelt Manikdena, is not amazing, exciting, impressive, stunnung, incredible - or what else of those attributes you need for a tourist broschure. It isn’t of extraordinary natural beauty, either. But for heritage travellers interested in the Buddhist culture of Sri Lanka’s ancient civilisation, the layout of the monastic complex in Menikdena is a perfect illustration of a typical systematically composed monastery from the second half of the first millennium AD. Furthermore, Menikdena is one of the rare places, where a modern Arboretum is integrated in an archaeological site. Menikdena had been left to the mercy of the jungle and treasure-hunters for centuries, this is why it’s a place of interest for botanists, too. The combined arcaeological and nature reserve is now a research area maintained and preserved by one of Sri Lanka’s oldest and most renowned private schools, the Trinity College in Kandy. 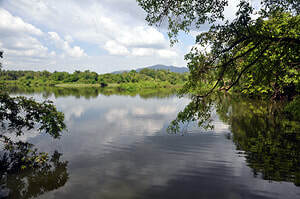 The Menikdena Archaeological Reserve and Arboretum, as it is named officially, is located 13 km south-southwest of Dambulla, within about two hours driving distance from Kandy. By road, it’s 4 km east from Pannampitiya Junction, which is halfway between Dambulla and Nalanda Gedige. The complex of ancient ruins lies between the small Menikdena reservoir and the Menikdena Range, also known as Nikula mountain, which reaches a height of 865 m above sea level. The tank covers parts of the ancient monastery, but nor important edifices are below the water surface, this outer area of the temple was reserved for plain dwellings of monks and servants, of which not much would have survived anyway. Besides Pidurangala, Ramkale, Enderagala and Kaludiyapokuna, the Menikdena temple was one of the monasteries of the so-called Sihagiri Bim, the region of Sigiriya, which was one of the major zones of cultural and economic development projects during the Anuradhapura period. 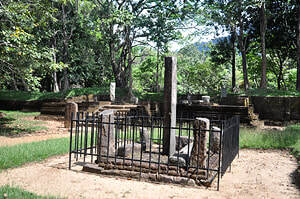 The area of Sihagiri Bim was a kins of connecting link in between the three other major zones of the kingdom, namely Anuradhapura to the northwest, Polonnaruwa to the east and Dakkhinadesa, which became the crown domain of the heir to the throne, to the soutwest. The Sihagiri Bim had its own system of irrigational, economical, monastical and militarical facilities. The area was of utmost strategical importance. 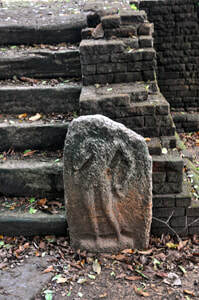 The ancient structures, remants of which can be seen in the Menikdena Archaeological Reserve today, are mainly from the late Anuradhapura period. The reason for this assumption is the regular layout of the monastic complex, which is typical for the 8th century. During its heydays, Menikdena seems to have been of some significance, also in the economic life of the region. However, there had been monastic life at this place earlier, when it was a densely forested region, which attracted seclusive monks, who sought some distance to the hustle and bustle of the huge monasteries inside the capital Anuradhapura, preferring a life of meditation. Since antiquity, King Kittisirimegha (555-573) has been considered to be the founder of one of this earlier temples in Menigama, which was known as Budugama or Buthgama those days. Budugama translates to “Buddha’s village” or “Buddhahood” village. The name may refer to ancient believes, that Buddhist enlightened beings, so-called Arahats, had once dwelt in this jungle area. Arahats are said to have lived in Sri Lanka only in the very first centuries of the Buddhist area, which corresponds roughly the pre-Christian era. Such legends may have attracted reclusive monks in the 3rd or 4th century, even before a royal monastery was donated by Kittisirimegha (also known as Kitthisiri Megha or Kitsiri Mevan). Due to its strategical significance in between the southwestern plains and the Polonnaruwa area, the region of Dambulla and Menikdena played an important role in the Sinhalese struggle independence from Chola occupations. The Chola forces were concentrated in Polonnaruwa, whereas the Sinhalese rebel armies advanced from the southern regions. During those Sinhalese campaigns in the second half of the 11th century, Menikdena probably served as a military base of the leader of the Sinhalese rebellion, Kitti, who after his victory became known under his royal name Vijayabahu I. One century later on, the regional ruler Parakramabahu I launched a campaign against Gajabahu II, the Sinhalese king in Polonnaruwa. 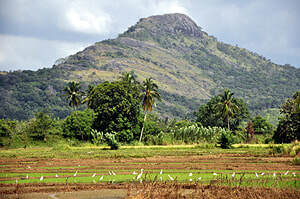 Parakramabahu’s stronghold was Panduwasnuwara near Kurunegala. As mentioned, Menikdena is situated at the base of the hills that separate the Kurunegala plains from the Polonnaruwa heartland. The name of the tank Atha Bandi Wewa near Menikdena might refer to a royal elephant. With the decline of the Polonnaruwa Kingdom in the 13th century, the focal point of the Sinhalese civilization shifted from the region now known as Cultural Triangle to the tropical wetzone in the southwest. The entire region of the former Sinhalese heartland was almost abandoned after a few centuries. 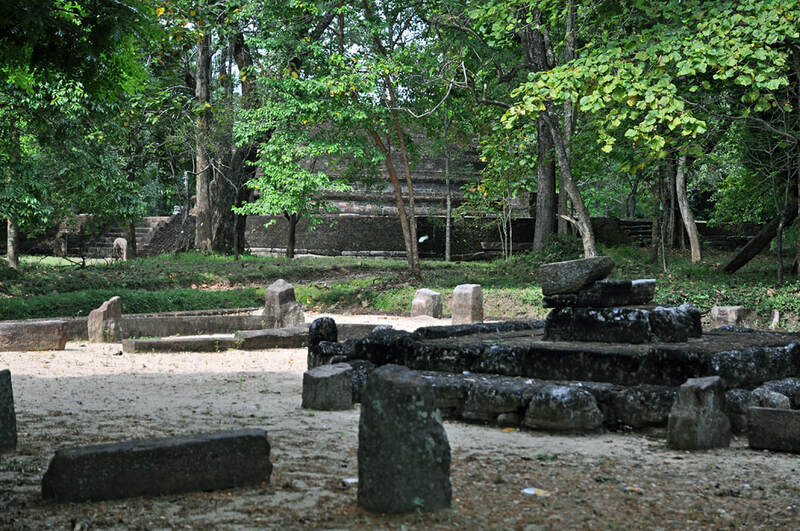 Ancient sites like Menikdena were reconquered by the jungles. After being rediscovered, Menikdena has been declared as an Archaeological Reserve in 1957. The modern name “Menikdena” refers to the occurence of precious stones in this region at the foothills of the highlands. The most famous “last Arahat” of Sri Lanka, Maliyadewa Thero, lived in the region between Damulla and Kurunegala. Menikdena is one of several places that claim to have served as his abode for some time. When the monk passed away, the ashes were put into a casket decorated with gemstones. The present name is said to refer to this burial, as “Menik” or “Manik” is the Sinhalese word for gems. The designated Archaeological Reserve of Menikdena covers an area of 2 hectares, whereas the entire forest sanctuary covers altogether 16 hectares. The entrance to the Archaeological Site is from the northern side, where the Menikdena reservoir is situated. The arrangenment of buildings, ruins of which can be studied in Menikdena, belong to a distinct and monastic standard type called Pabbata Vihara or Pabbatha Viharaya. Pabbata Viahara are known from the northern and eastern areas of Anuradhapura and numerous provincial locations. A first example was described by H.C.P. Bell in 1891, but it was A.M. Hocart one generation later on who identified this homogeneous layout as a distinct type of Sinhalese monastic architecture. S. Paranavitana coined the term "Pabbata Vihara" for this type, which translates to "mountain monastery". Actually, most Pabbata Viharas are found in the plains. The term refers to one characteristic item of this kind of monastic layout, namely that the major ceremonial edifices are arrangened in one group which is placed on a shared elevated platform. This platform is surrounded by a ring of monks’ cells on a lower level, which are usually arranged in a point-symmetrical pattern, with the ceremonial platform in the centre. The second characteristic is the regular arrangement of the four o five major structures in the centre. Four buildings are placed in the corners of the elevated platform, a fifth building is often found in the very centre. The four buildings grouped on the “Pabbata” are the Uposathagara, which is the hall for the highest ceremonies in Buddhist monastic life, and three buildings also or particularly used for Buddhist worship by lay people visiting the temple, namely a stupa for relic worship, a Bodhigara for tree worship, and a Patimagara for image worship. All these types of buildings, of course, where developed in much earlier periods. But usually they are scattered within a monastic compound, as they were not built at the same time, image houses are later supplements built wherever some space had been left free by older monastic buildings. 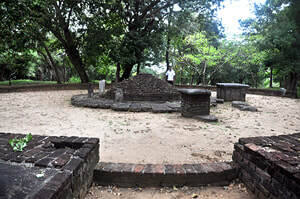 If there was any regularity in the groundplan of the monastic area, for example in the case of Anuradhapura’s large Jetavanarama complex, the stupa was placed in the centre. But usually the ceremonial edifices were distributed in an irregular pattern in a garden-like plot of land. When new monasteries were more systematically planned in the late Anuradhapura period, the regular layout of the four major buildings became more common, particularly for medium-sized monasteries in paddy-cultivation areas, Menikdena being a perfect example, whereas the other contemporary monastic type, the Padanagara Viharas of the Pamsukulika fraternity, were more remote and less connected to village life. When arriving from the car park, you will first see the outer walls of the “Pabbata”, the large ceremonial platform that once formed only the centre of the entire complex. Menikdena has one more than the four structures always found in such monasteries of the Pabbata Vihara type. Besides the stupa, Bodhigara, Uposathagara and Pathimagara, there is a fifth structure in the very centre of the complex. This is a Dharmasalawa, a preaching hall, or a hall for the monks’ everyday-meetings. Menikdena is one of the few monastic sites, where the remains of all five sacred monuments can easily be identified. The entrance to the Pabbata platform is from the side of the reservoir. Six wide granite steps are flanked by guardstones, a plain undecorated moonstone is in front of the stairway. To the right-hand side is a granite pillar inscription. The central “moutain” level of Menikdena is of an almost square groundplan. On the left to the entrance is the Stupa which is built on a larger terrace. The entrance is a set of granite steps, again flanked by guardstones. At the top on the sides of the steps is a carved animal which presumably depicts a lion. Only one Buddha statue, not in a good state of preservation, has remained in situ. A Buddha footprint, called “Sri Patha“ or “Sri Pathula”, and a broken oil lamp made of stone are at the site of the stupa, too. It looks like a stone discus on the ground. The cardinal points of the slightly flattened stupa dome are not marked by attached Vahalkadas, as usual, but rather by separate small shrine rooms for flower altars, three of which altars have been partially restored, whereas one has been left as it was found in ruins. Opposite the stupa is a circular structure, which is quite remarkable. One could conjecture this was a Vatadage, a classical Sinhala round temple. But a Vatadage is a building containing a stupa. 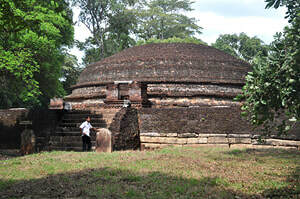 That’s why a small modern stupa was complemented after the excavation of this circular structure. But most probably this interpretation was wrong, as in an ancient Pabbata Vihara only one of the four or five major buildings is a stupa, the stupa of Menikdena obviously being the structure on the opposite side. Archaeologists now agree that the circular temple in Menikdena was the Bodhigara, the tree shrine, where a sapling of the Bo-tree was venerated. This hypothesis is strengthened by the existance of a drainage system, which is not required for a Vatadage but is known from several other Bodhigaras excavated in Sri Lanka. Admittedly, most Bodhigaras have a square groundplan. But in the meantime, some other Bodhigaras with a circular layout have been discovered in Sri Lanka, too. Hence, the circular form is not an objection against the assumption, that this structure was a tree temple. The round Bodhigara of Menikdena had four entrances at the cardinal points, which were marked by simple moonstones, three of which are still recognizable. 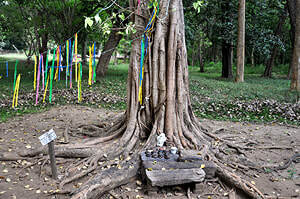 In the interior, there were four altars in front of the pedestal of the sacred tree. There was a ring of pillars in between the outer wall and the central object of worship. Most likely this row of columns once carried a wooden roof, which was open in the centre, where the tree towered the building. Guardstones habe been found at the Menikdena Bodhigara, too. Further south, behind the round Bodhigara, was the Chapter House, it‘s called Sannipatha Shalawa or Uposathagara. The hall served for the highest monastic rituals such as the Pathimokha ceremony on fullmon days and the Uposatha ordination of monks. The Chapter house is believed to have had upper stories made of wood. This could explain the thickness of the magnificent stone pillars. About three dozen columns are in situ, some are still in upright position. The image house in the southeastern corner of the Pabbata platform is said to have contained about ten statutes apart from the main image of worship. None of them has survived. 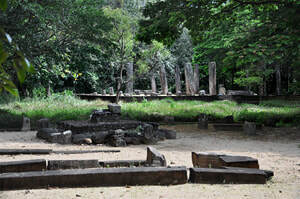 A second assembly hall of the monks was situated in the very centre of the Pabbata platform. It’s called Sabalawa or Dharma Salawa. It’s not uncommon, that Buddhist monasteries have two assembly halls, one for the highest ceremonies and one more for every-day affairs of the congregation. It isn’t uncommon, either, that the less sacred of the two edifice is more emphasized in the layout of monastery. For example, in Thai monasteries, which called Wats, the ordination hall, the Uposathagara called Bot, is usually smaller in size than the congregation hall, which is known as Vihan in Thailand. The name Dharma Salawa literally translates to “Teaching Hall”. Such open halls serve for instructions of laymen in modern monasteries of Sri Lanka. By the way, “salawa” is etymologically related to the English terms “saloon” and “hall”. 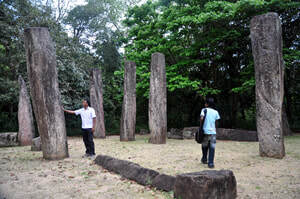 The archaeological site of Menikdena now is also an arboretum, which is the only one in Sri Lanka’s intermediate zone, which is defined by the level of annual precipitation. Annual rainfall in Menikdena is between 1700 an 2500 mm. The Menikdena Arboretum represents the character of a transition zone from mixed evergreen forest to typical dry-zone scrub jungle. Groves of old ironwood trees are found near the streams. The renowned Trinity College in Kandy, which is one of Sri Lanka’s oldest private boy-school for primary and secondary esucation, founded by Anglican missionaries in 1872, has maintained this arboretum and carries out botanical and zoological studies in Menikdena. The development project of the “Menikdena Archaeological Reserve and Arboretum”, as the site is officially known, had been initated by the Historical and Geographical Society of the Trinity College in 1994. The reserve is administered in cooperation with the Department of Archaeology and the National Herbarium. It was Sri Lanka’s first collaborative project of this kind. The arboretum component of the project was completed in 1997, with about 500 tree labels for more than 100 tree species. About 200 plant species, eight of which are endemic forms, occur in the Menikdena sanctuary. A study on the herpetofauna (reptiles and amphibians) of the Menikdena arboretum was carried out between 1998 and 2001 by the Natural Society of the Trinity College. A total of 63 herpetofauna species were recorded in the survey, 20 of which are endemic to Sri Lanka. 16 species recorded in Menikdena are threatended. 47 of the herpetofauna species are reptiles, including 24 species of serpents, of which 7 are endemics. The isolated peak of Menikdena, also known as Nikula mountain, can be climbed. The hike along a footpath and slopes of rock surfaces will take about five hours up and down. From the vantage points at the summit and close to it, the central area of Sri Lanka’s Cultural Triangle can be overlooked, more precisely: the Sihagiri Bim. Other peaks in the surroundings, that can be seen from Menikdena, are the 613 m high Belyakanda and the 766 m high Ritigala Range and the 559 m high Gedaragalapathana Peak aks the 695 m high Erawalgala at the horizons. Not so far the west is the 782 m high Nalanda Rock. Another nearby peak is Lenadora, which is another achaeological site in the Sihagiri Bim.